The One With the Daleks, for example. Yes, it was rushed. Yes, the revelation that Braceman was an android should have come at the end of an episode, when we'd had time to get to know him, not five minutes after we met him for the first time. Yes. there's a sort of glitch in that it took Braceman ten minutes – it's carefully specified in the script as ten minutes – to jury-rig the Spitfires into spaceships, when, even supposing him to be a Dalek supercomputer, it should have taken at least a fortnight. But even that's not the sort of glitch I can bring myself to get really cross about, because it means that the show is being driven by narrative logic, not engineering logic. Given that he's an android with Dalek blueprints it makes sense that he can rustle up something with which to defeat the Daleks. Given that he can, I don't think my enjoyment would have been greatly enhanced by a caption reading "three weeks later, he did." After 47 years of careful thought, Terry Pratchett has spotted that Doctor Who isn't really science fiction. In other news: Bob the Builder is an inaccurate depiction of the modern building trade. Do you remember that day in ninetyseventysomething when the Test Match was rained off and the BBC put the Peter Cushing Dalek movie on, unscheduled, on Saturday morning? Or the earnest boy in the school blazer perfectly describing how the Doctor had beaten the Daleks in the previous clip, and Michael Rodd saying "Only the Daleks could be so stupid! ", patronisingly? Or even the ninetyeightysomething Panopticon which showed the Invasion of Earth movie on Saturday night, and Jeremy Bentham telling the nearly empty hall that they had just relived the days of Dalekmania? It's like Russell wanted to the Daleks to be sensible, believable, dark, metallic, Klingons that went up stairs and had existential angst and weird religious fanaticism but who were a little bit pathetic even -- especially -- when they were trying to destroy the whole of Life, the Universe and Everything. Steven wants them to be great big exciting toys in a flying saucer with an interior that looks like how the interiors of flying saucers ought to look, and unceremoniously wipes out the Rusellite half-Daleks in a single scene. The Daleks aren't serious believable alien life forms: they just aren't. They're 1950s outer space robot people with an impractical design: more like Smash Martians than Borg. I didn't think that the Doctor was really going to destroy planet Earth, of course, but I did feel that he was being presented with a moral dilemma that was a little on the hard side and he did seem to have to think about it a little bit. It really is beside the point to say that it wasn't a very believable portrayal of Winston Churchill. There are people out there who think that Doctor Who ought to be about time travel -- that a story set in the War ought to be a story set in the accurate historical War and that cave men should speak with the kind of received pronunciation BBC accents that modern anthropology tells us that cavemen really spoke with. Russell was wrong to say that Doctor Who historicals should be like Horrid History books. Horrid History books are mainly about executions and toilet paper. But Doctor Who historicals have always been set in the world of English school history text books. This may not have been Winston Churchill, but it was Winnie. Not true, necessarily, but certainly memorable. It's like Russell wanted to the Daleks to be sensible, believable, dark, metallic, Klingons that went up stairs and had existential angst and weird religious fanaticism but who were a little bit pathetic even -- especially -- when they were trying to destroy the whole of Life, the Universe and Everything. Hmmm. In "Dalek," maybe (though strictly speaking that's not a Davies story), but that's certainly not the sense I got from the rest of the series. In fact, I'd say that the Daleks became pathetic in spite, rather than because, of Davies's efforts. Seems to me that you're describing Parting of the Ways here. The interior of the Dalek ship in that very RTDish episode certainly looked exactly like the interior of a Dalek ship. I hoped we'd see more Doctor-and-the-only-Dalek following on from that. Instead we got Only Surviving Dalek Resurrects Davros and Creates A Giant Dalek Empire -- the inevitable fruit of RTD's bigger-is-better philosophy for season finales. Sigh. And now it's too late for us ever to have a My Dinner With Dalek Caan episode. Although given how the My Dinner With Blon Fel-Fotch Pasameer-Day Slitheen episode worked out, maybe that's not such a disaster. The cookery book I'm re-reading at the moment ("Good Things in England" by Florence White, first pub. 1932) has a recipe for "Scottish Fish Custard, 1931". It sounds a bit bland, but not inedible - a lightly-seasoned egg and milk mix poured over haddock and cooked in a slow oven. I imagine you could even make it work with fish-fingers, although the crumbs wouldn't be very good for the texture. Fish custard sounds like the sort of thing that Heston Blumenthal could get right. And I got the impression that terry Pratchett's big grouse was with things like the use of the sonic screwdriver as a magic wand, which solves every problem except the ones that the writer wants it not to. That's just poor writing technique. I'm not surprised that a craftsmanlike writer like Pratchett should find it annoying. Send high quality scan of recipe book soonest. I feel a teeshirt coming on. It's rather small print and it's a paperback(*) so a good-quality scan will be tricky, but I'll see what I can do. Failing that, I can give you a verbatim transcript that you can typeset to your own satisfaction. Florence White died in 1938, so you should be OK for copyright. (*) It's a modern reprint by Persephone Press, but it looks like the the original layout. You can put the words New and Old together in as many combinations as you like, Andrew, but you're not going to get away from the fact that the new design is comically lousy. 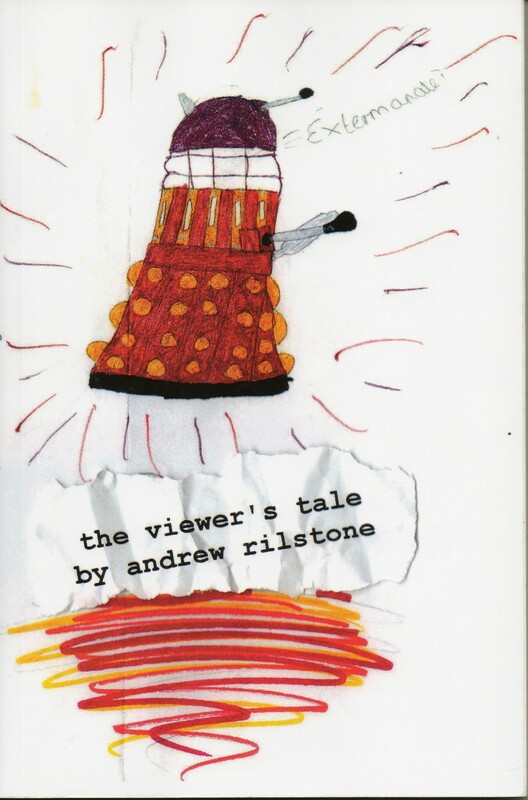 All that you've said about a fantasy world being more honest for Doctor Who than an attempt at a real world is absolutely true but would be just as true with the 2005 Dalek design as with the 2010 design. If making monsters bigger and bulkier and with boomier voices intrinsically made them scarier and fiercer, the Giant Robot would have been the scariest thing ever. The 2010 design might more resemble the design from the old B&W days (if you close your eyes) but the design was lousy in those days too. If we accept that the concept of the Daleks is fundamentaly rubbish, what's to stop us from at least making it look as cool as possible instead of making it look rubbish too in order to rub in the irony of it? BBC Merchandising drove the 2010 design and we know it in our hearts, however much we may stick our fingers in our ears and hum "om mane bigger and fiercer padme hom". When my old plastic Dalek bubble bath bottle from the 70s looks more solid and less likely to blow over in a light breeze, something's gone wrong. The design team at Cardiff have had a pretty disastrous year all round really. Some achievement to take the TARDIS, the whole raison d'etre of whose design is that it's bigger on the inside, and replace it with a design whose principal camera angle makes it look cramped.